On Saturday, I began my journey back home from Modesto. Naturally, I was going to try getting the most out of the day with plenty of courses still left to play between there and here. 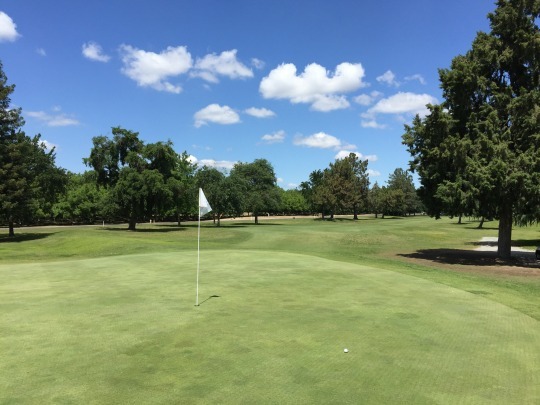 There are actually two courses in Madera right off the 99 with very similar names. 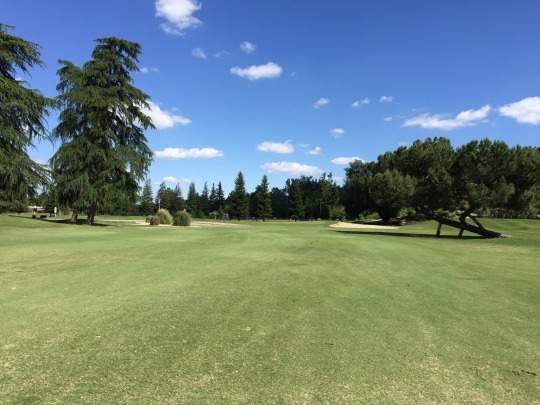 One is Madera Golf & Country Club, which is a private club. 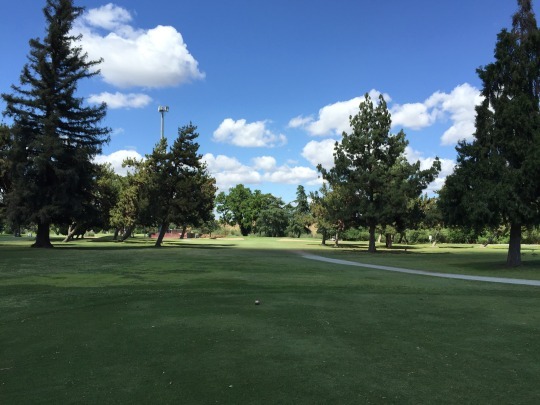 Then there’s Madera Golf Course. 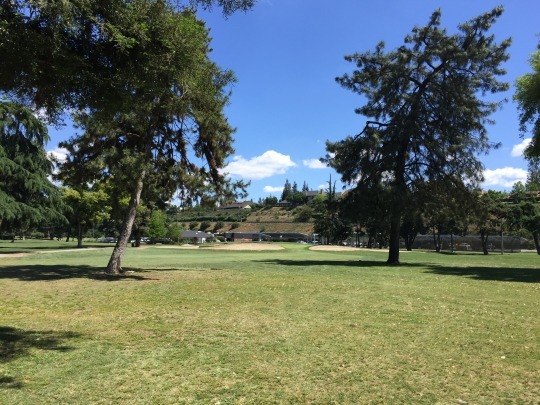 It is the public option and generally referred to as Madera Municipal to help with that distinction. 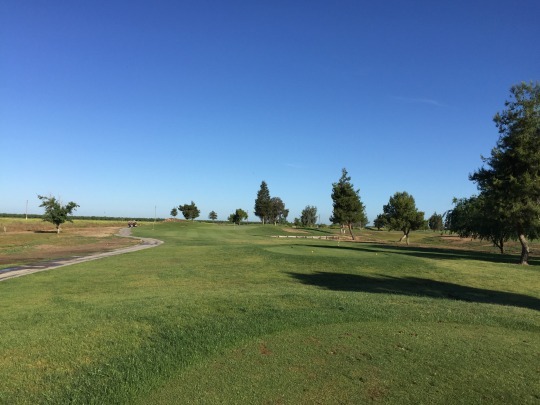 I had booked a 7:00 tee time through GolfNow for $43. It wasn’t any sort of discount, however that time was not listed on the booking site of this course. I guess it was because it was for a single player only and their site only offers 2-4 player bookings. I expect most public course, especially munis and especially on weekends, to start play at first light in the morning. However, Madera does get going at 7:00 this time of year. I was paired with a twosome and I believe we were scheduled to be the first ones off. Unfortunately, those guys checked in a little late, so the starter sent another foursome off at 7:00 in front of us. They were a little slower than us, though, so they ultimately let us play through at the turn. Overall, it was still a nice 3.5-hour round. 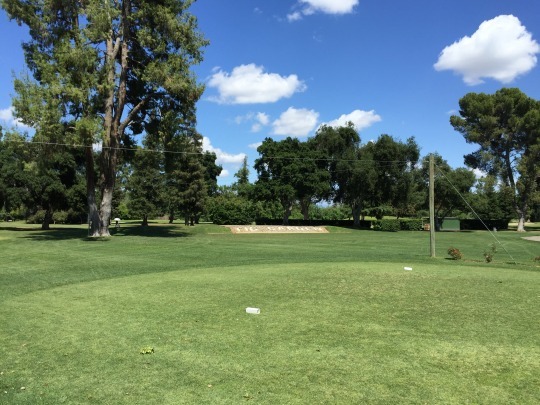 The first thing I noticed at Madera was just how green and lush the course looked. 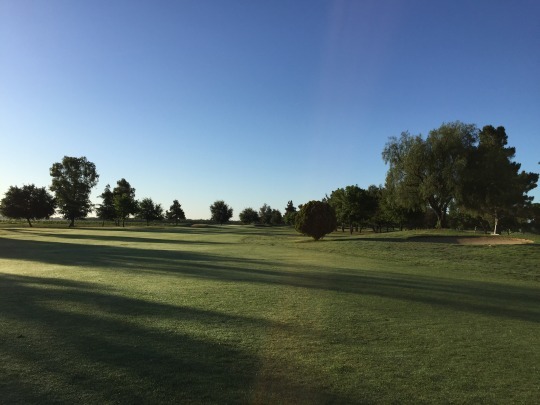 The weather was nasty for me the day before, but it was picture perfect on Saturday morning and the course came alive in the early morning sunlight. 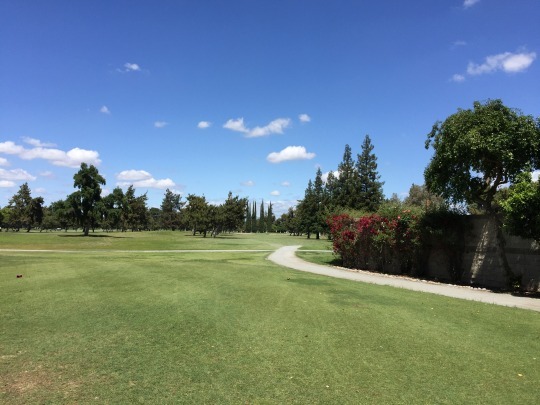 As is the theme throughout the Central Valley, Madera is another pretty “traditional” style course. 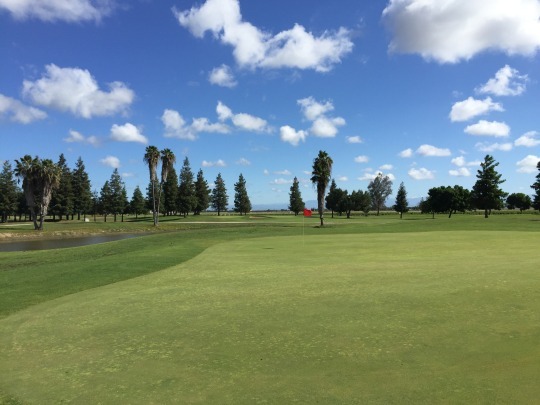 It plays next to some farmland and the local airport, so the terrain is flat and the layout is pretty open from tee to green. 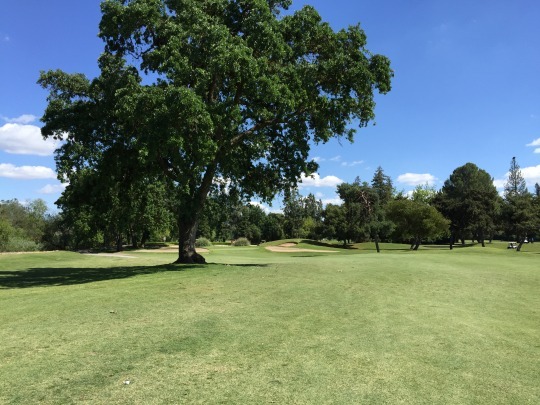 The trees definitely do not come into play here as much as some other courses I visited. 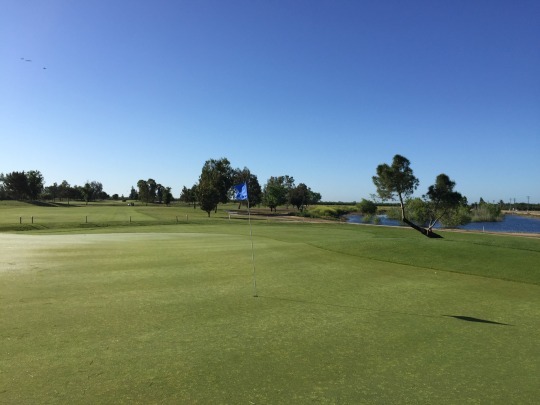 The back nine brings a few water hazards into play and offers a little more challenge. 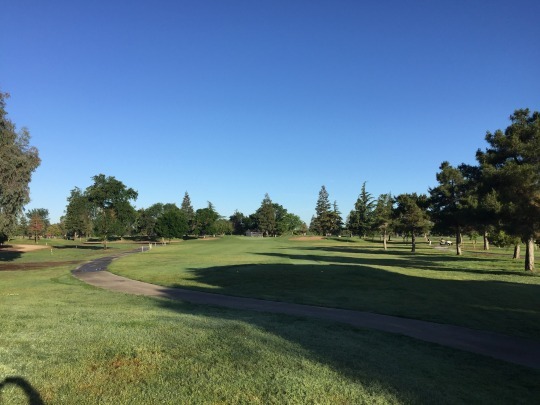 This side of the course reminded me a bit more of Pheasant Run, which is a little further north in Chowchilla, and is a sister course of Madera. In fact, the guys I played with mentioned a pretty sweet club deal. 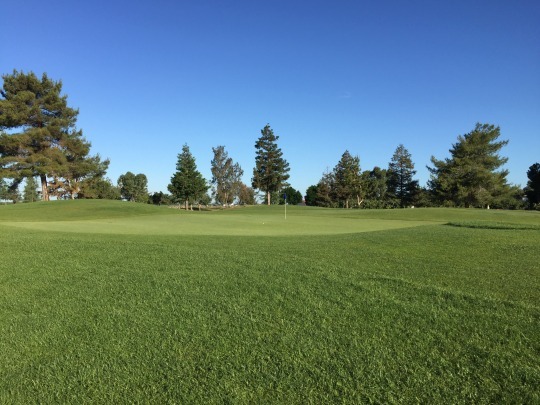 It’s a little over $100 a month for unlimited golf at both courses. 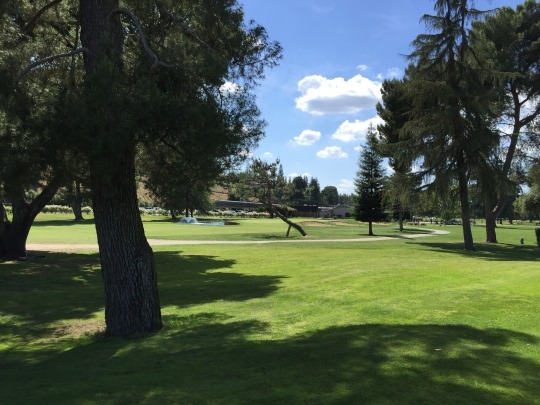 They do have to pay $15 cart fees if they want to ride, but both are easy walking courses. 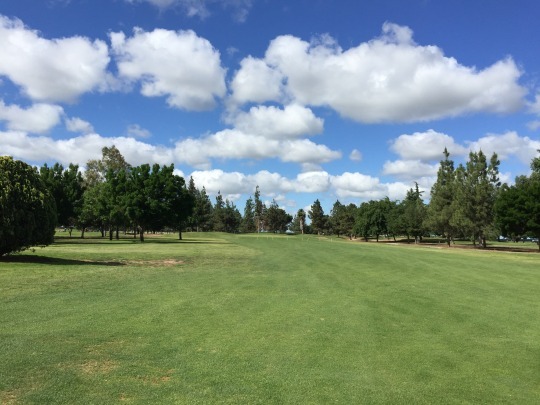 Ultimately, the conditions outshined the course at Madera. The layout is fine, but nothing overly distinctive. At the same time, the conditions varied a little between the front and back nines. It was interesting. The front was really well-kept all the way around. There were some outer areas that have obviously gone through some “turf reduction” protocols because of the drought. Everything in play, however, was fantastic. The tee boxes were nice. 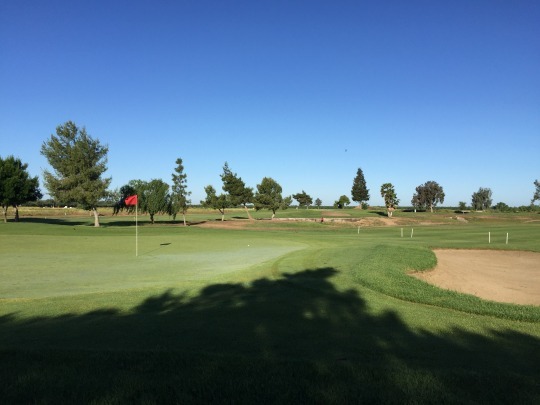 The fairways were excellent and the rough was thick and deep. The cuts looked super clean and everything was framed so nicely. 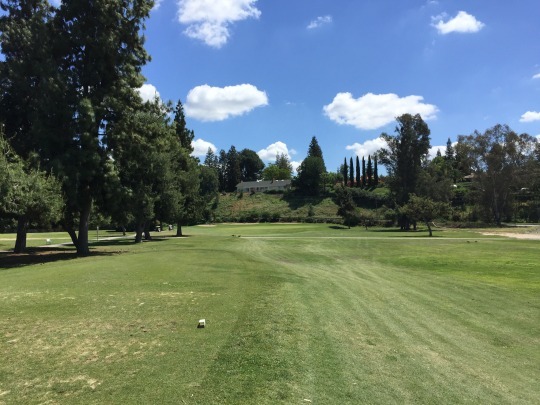 The conditions on the front nine here right now would rival even the highest-end resort courses in SoCal, except for maybe those in the Palm Springs area. Then, on the back nine things were not quite as sharp. 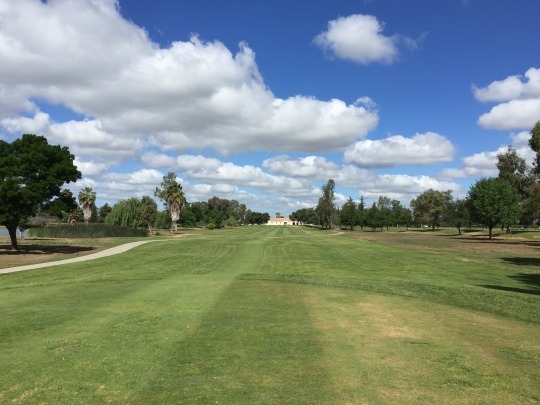 The tee boxes were fine and the fairways were still quite good. They were still a clear notch down from the front, though. The rough was an entirely different story. It varied wildly on the back nine. There were still some nice lush sections and generally everything looked pretty good from afar as you’ll see in the pictures. But then up close there were a lot more bare and patchy areas, too. It was okay, but felt like a bit of a step down after the front was so nicely kept. The greens were consistently mediocre throughout the course. Apparently, they had some real issues here last year and the greens completely died. They’ve been working hard to bring them back and are just starting to get pretty decent again. The turf is still a bit too firm. The surfaces were slow and sometimes bumpy with many patches of poa annua growing in to create inconsistencies. I’m guessing the poa intrusion was the problem before and whatever they tried to get rid of it backfired. 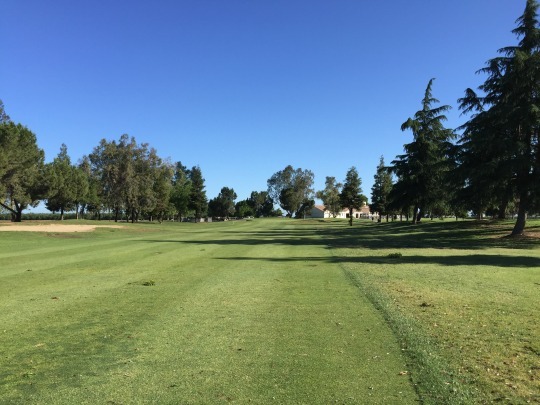 On the front nine, it wasn’t too hard to adjust to the slower speeds. On the back nine, however, almost every green was covered with all sorts of debris from the trees around the course. It made putting a real guessing game because there was no way to clear it all away and you just had to hope you hit all the right pieces of debris in your line. So, even though the greens are still not ideal, they are not that bad and look like they’ll continue to get better with more time. It’s more of a shame that they aren’t clearing the insane amount of debris off the surfaces because that is something the greenskeepers can control somewhat reasonably. 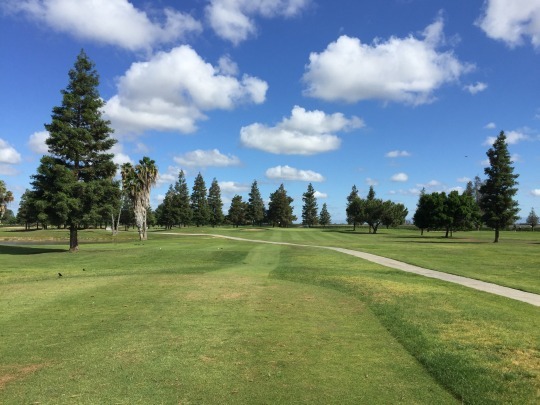 All in all, though, Madera offered a quality golf experience at a reasonable municipal course price. 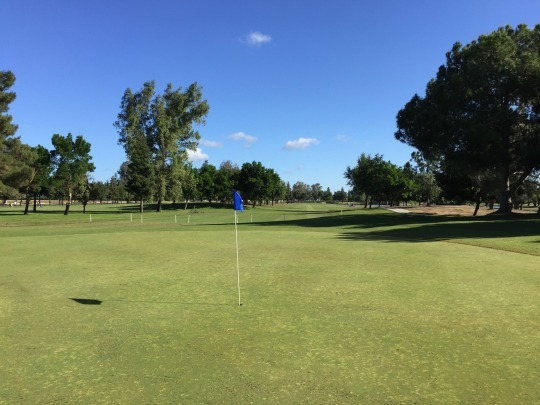 The conditioning from tee to green was far above average and the layout is solid enough. Next, I was planning to go a little further south into Fresno for another round or two before heading home. 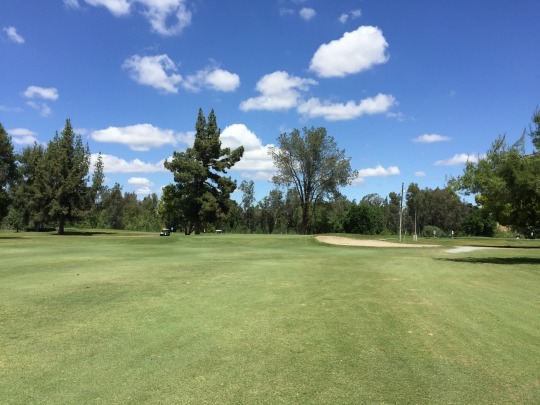 My initial plan was to play Riverside Golf Course. It is conveniently located and their spring maintenance (i.e. aeration) was already completed awhile ago. I already had my fill of aerated greens, so playing something that was fully healed up sounded more appealing. My plans had to change when I pulled into the Riverside parking lot to see a lot of people out there and a tournament check-in booth set up out front. I went into the pro shop and they told me there were two tournaments out there that day and I was out of luck. Note: This course is now closed. 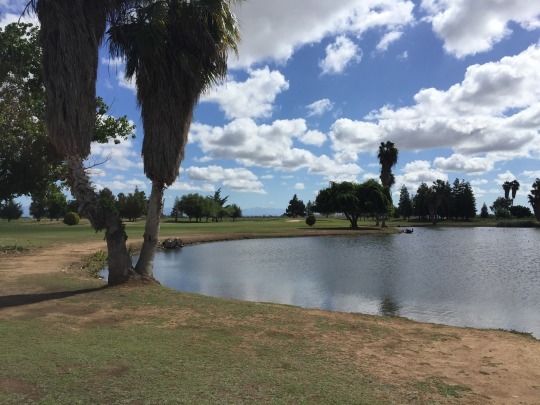 Apparently, the driving range and bar/restaurant are still open for business, but the golf course is no longer in operation as of January 2019. 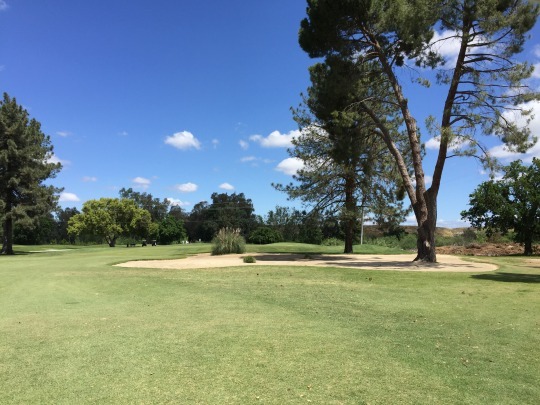 I was able to book an 11:39 tee time on my phone before heading over from Riverside. The price was $44 with a cart. 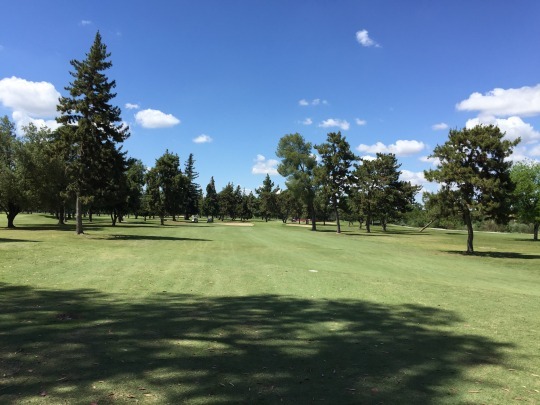 The online tee sheet was wide open, but at the course it was a different story. This place was packed, and I’m guessing largely because Riverside was off limits to its normal Saturday crowd. I was paired with two other singles and we went off closer to 11:50. There was a lot of confusion early on as the groups ahead of us had some coordination issues. I won’t go into detail, but they really plugged things up directly in front of us for much of the front nine (it took about 2.5 hours). By the time we had made the turn, the groups started to space out more naturally and things moved along much better. That nine took two hours. Overall, the 4.5-hour pace was fine on such a busy Saturday afternoon. 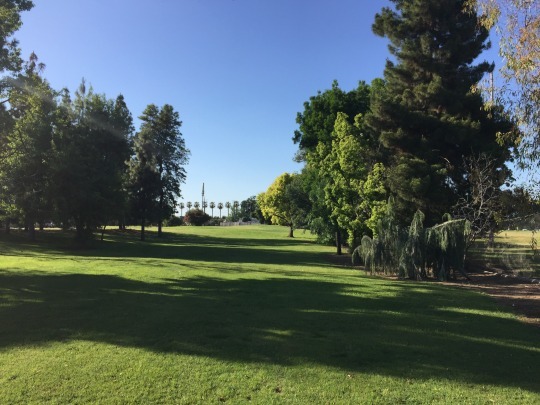 Fig Garden is located alongside what is supposedly the wealthiest neighborhood in Fresno. As you drive down the side street that takes you to the course, you will pass some crazy big McMansions that are very much over the top with their designs. These swanky homes sit atop the hill that overlooks the course down in the valley next to the river. I liked the aesthetic look of the course as soon as I pulled up. There are many big pine and fir trees on the property and it feels more like a mountain setting than Fresno. 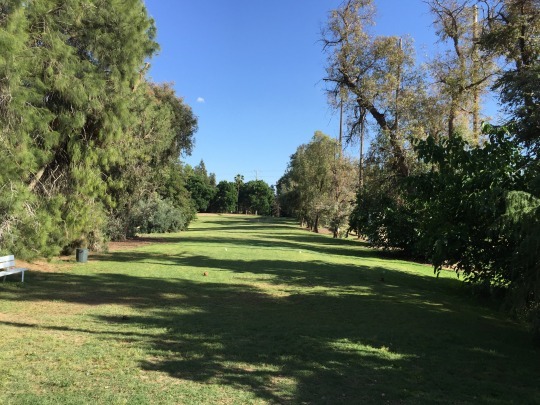 There are no elevation changes on the course itself, but it doesn’t feel like a flat or “traditional” Central Valley course. I definitely wouldn’t consider this a traditional layout anyway. It is kind of quirky in several places. Those trees come into play a lot. There are some very tricky and narrow doglegs. 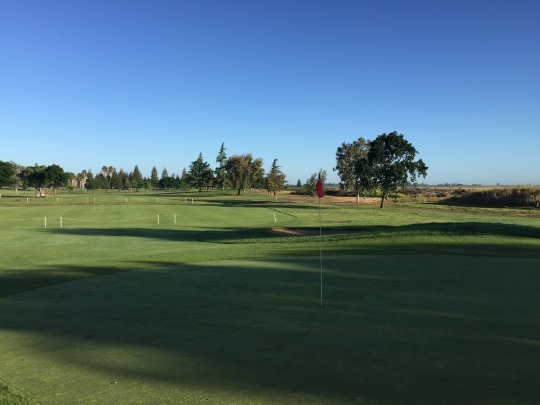 There are some short risk/reward holes and some lengthy beasts, so it’s a course that will test every part of your game. At the same time, it’s not overly difficult and won’t beat you up too much. I would call it a “fun” course. The holes that stood out to me most were the back-to-back par-4s of 12 and 13. Both are severe doglegs left with trees very much in play and local knowledge goes a long way on each of these holes. I thought I hit an awesome drive over the corner on 12, only to find myself blocked out completely by a huge tree in the middle of the fairway. 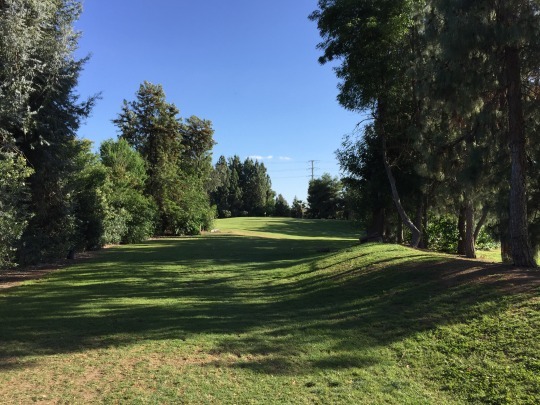 It is totally a lay-up hole because you want to be further back of that tree in order to play over it on your approach with a full wedge. 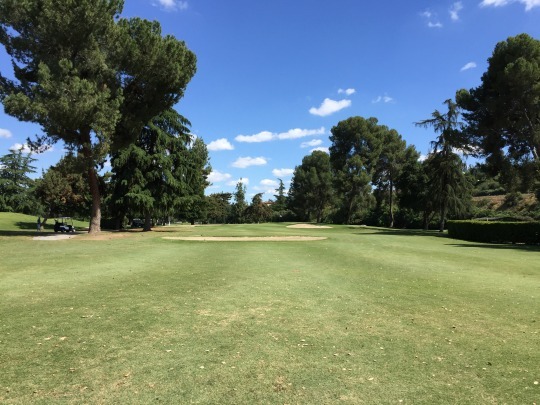 The 13th offers and awkward tee shot because of some tall pines right in the middle of the fairway at the corner. It’s hard to tell where the ideal lay-up spot is, but you want to stay well right and it’s a pretty easy hole if you give yourself a clear angle from there. Big hitters may be tempted to try and go over everything and at this green, but not much good will probably come of it without a lot of luck. The signature hole at Fig Garden is the 18th, which was obviously converted at some point from a short-ish par-5 to a beastly long par-4. Water guards the green, which would make it a really great par-5 finisher with excellent risk/reward options. Now, it’s just an extra tough par-4. 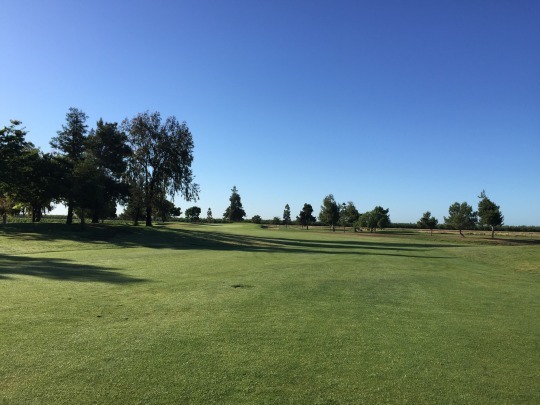 From the blue tees, it measures 473 yards and from the whites it is 440. 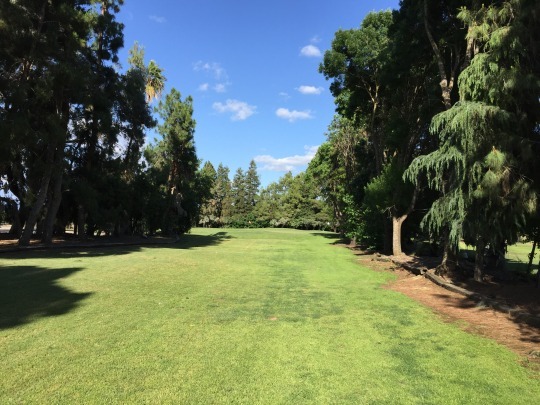 The tee shot is narrow with OB on the left and trees along the right and then you have that water to worry about on your approach. 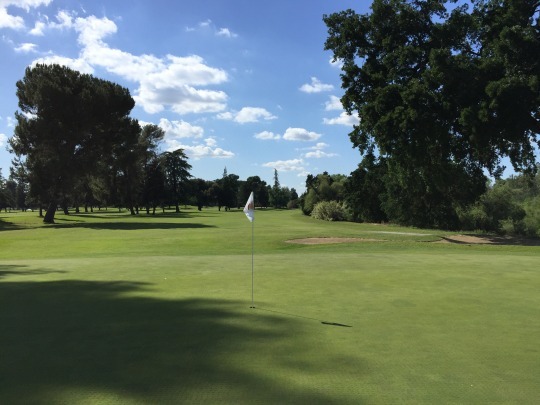 It’s a big challenge to finish your round with! I knew Fig Garden had aerated their greens in early April, which is why this wasn’t my first choice for this trip. The greens are probably a few weeks away from fully healing. It seems they didn’t really fill in the holes with sand consistently, so I think some of them will heal better/faster than others. On Saturday, they were very bumpy and slow because of these inconsistencies. However, I could tell that they are generally good surfaces. Other than the greens, the course was in good overall shape. I wouldn’t say great, but it was pretty good throughout. It was definitely above average on most levels. The tee boxes were fine. 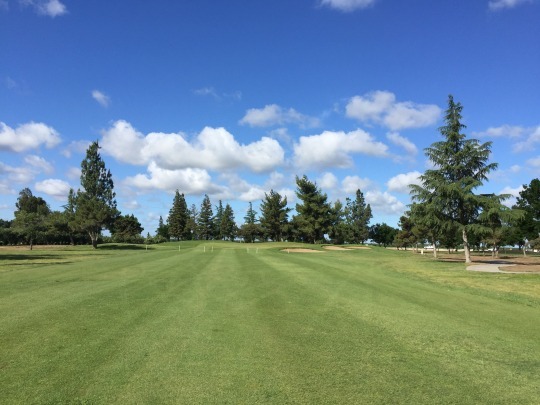 The fairways were mostly nice with some firm/thin areas here and there. The rough was not too much of a factor, but generally pretty well kept. 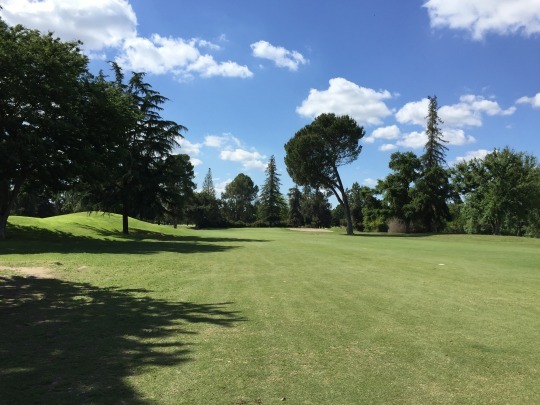 Because of all the trees, there were pine cones, needles and leaves all over the place, so any ball in the rough was also usually surrounded by a lot of debris. I was in a couple bunkers and they were decent. 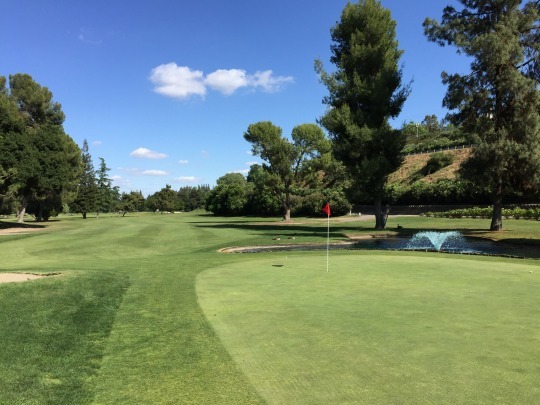 I wanted to like Fig Garden more than I did because it seems like my type of course with a fun layout and the pretty setting, but I still enjoyed the course a lot. I wouldn’t hesitate to recommend it, though the course probably isn’t for everyone because of its quirks. This is a course I’ve been wanting to play for a long time. Part of me dreaded it because I knew it would be a dump. The other part of me was excited because it’s such a stupidly memorable name. Either way, I felt compelled to check it out and I was determined to finally play it on this trip. As I pulled up to the course, I saw what I expected. Kind of a crappy little place. They did have a pretty large driving range that was quite busy, but nobody was out on the course. 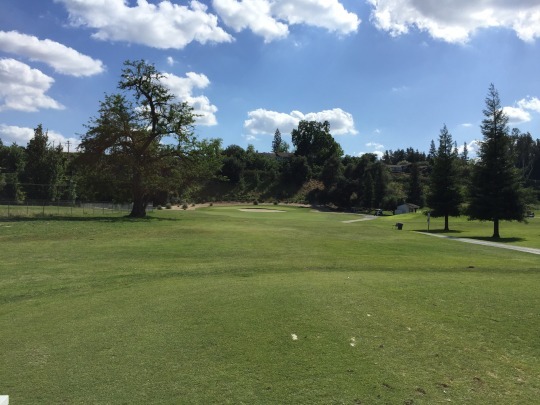 I paid $14 for nine holes, which seemed like too much. It felt like it should be a $5 course. Obviously, the course is not what keeps this place in business, but it is there. The course itself was actually much more interesting than I expected. In my head, I imagined a cow pasture with some crude form of a golf course cut into it—kind of country version of Holmby Park in LA or something. 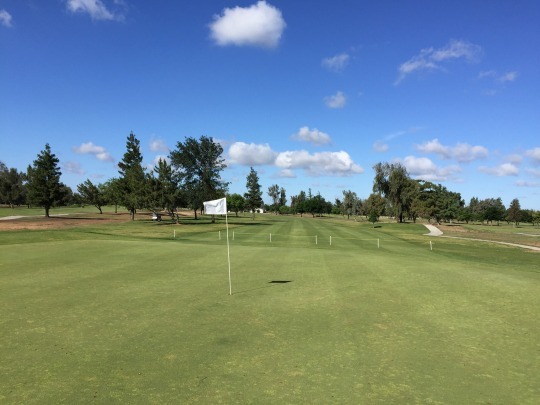 The course winds its way around and behind the driving range. 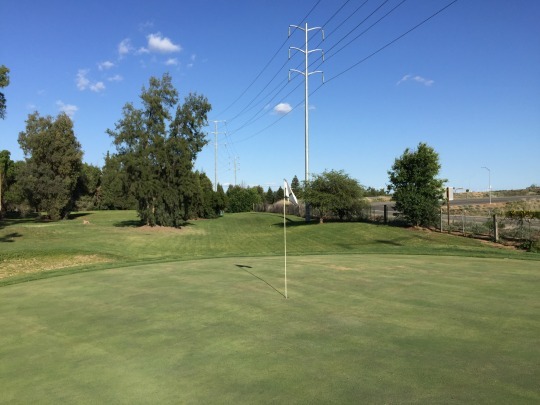 It is kind of scary in places because the nets are basically gone and there are range balls strewn throughout the course, so you never know when one might come flying your way. 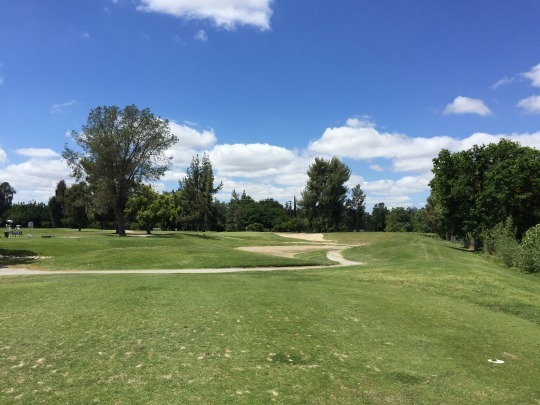 The course plays through a little wooded area, has some slight changes in elevation, and features some severely undulated greens, so it’s not a bad little layout. Each green has two holes/flags for front and back nine play, and then there are corresponding tee boxes, too. 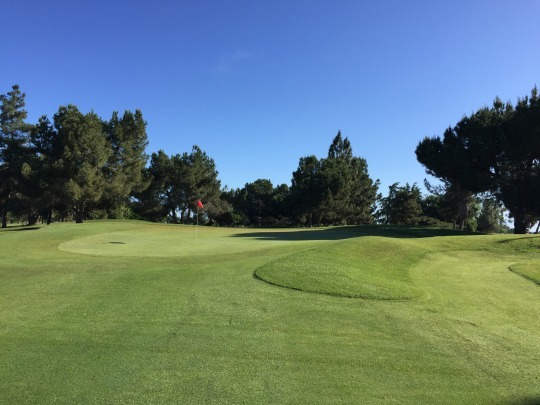 The shortest hole is 85 yards while the longest is 185. 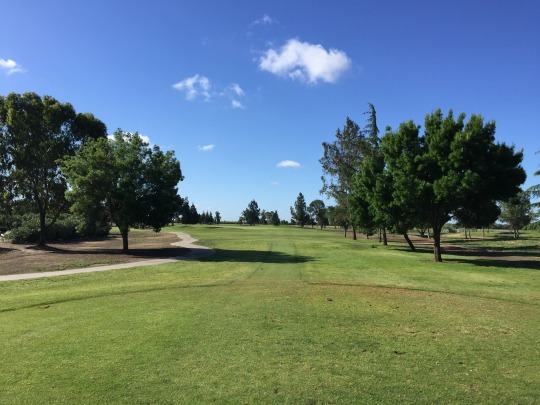 However, none of the holes played as long as anything listed on the scorecard. All the tee markers were clearly moved up. I generally just had to make my best guess on the actual yardages because there weren’t many indicators to work with. The course proved to be a bit more interesting than expected, but the conditions were rather rough. It doesn’t look so bad in the pictures because there was some green grass out there. Up close and personal, though, things were pretty terrible. Any ball that’s not on a green was subject to any kind of bad lie imaginable. The greens were not too great, but I will say they were not aerated and that was kind of nice after playing so many punched greens on this trip. I’m glad to have finally checked Hank’s Swank off my list, but a round like this also kind of makes me question the things I do for this blog. I can understand why some locals might have a soft spot for this place and the silly name makes it much more interesting than it actually is. I don’t know who Hank is and I don’t really care. I do know he was also associated with the now defunct Woodlake Ranch course a bit further south. 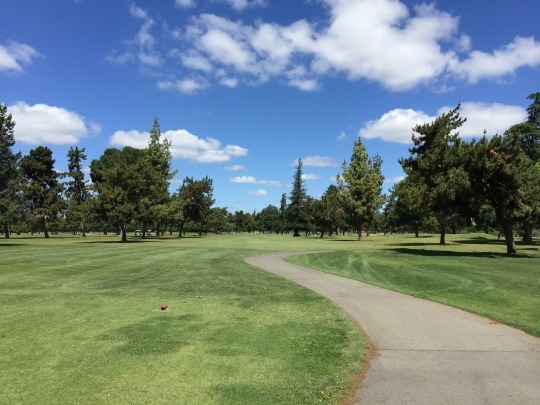 Either way, he’s still got his swanky little course in Fresno and I played it, for better or for worse.